It’s October, which means it’s time for pumpkin spice lattés, apple picking, and the re-emergence of comforting fall soups. 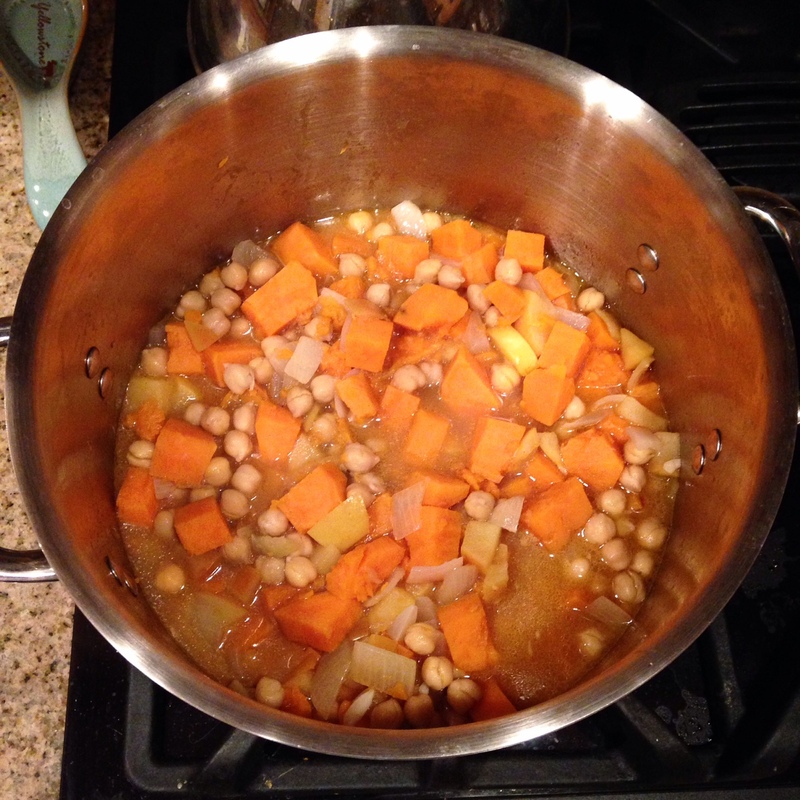 I threw this simple soup together last night with a few basic ingredients, and my husband and I loved the result. So I thought I’d share! This soup really couldn’t be much easier. It’s quick to prepare and doesn’t require a single perishable ingredient from the refrigerator. It’s a great way to use up mealy apples that have gone slightly past their prime. Serve it as an appetizer at a dinner party, or enjoy it for lunch in your house while wearing your favorite sweatshirt and slippers. Vegan, dairy-free, and gluten-free. Recipe makes about 8 servings. Add some high-heat oil to a large stainless steel pot, and turn heat up to medium. Add the chopped onion and a sprinkle of salt; cook until soft. Add the garlic and cook for 1 minute longer. Add the cubed sweet potato and apple, pour in some vegetable stock/broth or water to barely cover the ingredients, and bring to a boil. Lower heat, cover, and simmer for about 10 minutes, until the ingredients are soft and mushy. Rinse the chickpeas and add them to the pot. Add the olive oil or coconut oil, cinnamon, and five spice powder. Cover and cook for another five minutes to allow chickpeas to soften. 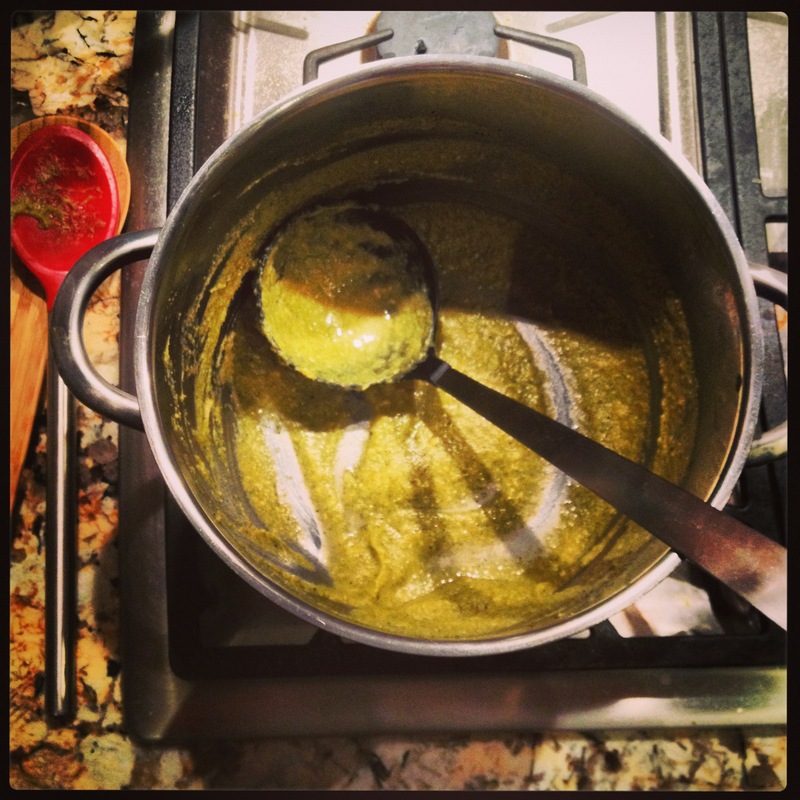 Purée the soup by using a hand blender directly in the pot (by far the easiest way!) or by transferring the soup to a blender or food processor. Add salt or additional spices to taste. I love creating soups from scratch without a recipe. Sometimes the results are just “meh,” but sometimes I hit upon a dish that I think it worth repeating. Last night, I assembled a concoction that I found particularly delicious (I had 4 helpings!) so I thought I’d share the recipe with you. This is a hearty-yet-light soup, packed with vegetables and perfect for early fall. One of my soup rules is that it’s fine to add or swap out ingredients freely based on what you have in your kitchen. Don’t have beef broth handy? Use veggie stock instead. Have some carrots that are about to go bad? Toss ’em in! Soup can be a receptacle for pretty much any vegetable that you need to use up. Dairy-free, gluten-free. Recipe makes about 6 large servings. Add some high-heat oil (I used safflower oil) to a large stainless steel pot or an iron/ceramic dutch oven, and turn heat up to medium-high. Once pot is warm, add in beef cubes. Brown the beef on all sides. 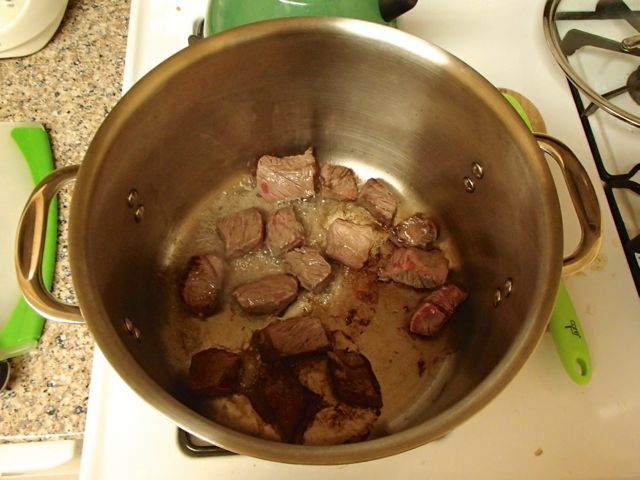 Once beef is browned and sticking to the bottom of the pot a bit, pour in red wine. Allow wine to cook for a minute, then pour in box of broth. Bring to a boil, then cover and simmer. While this is simmering, you can chop up all the veggies. Beef should simmer for about 30 minutes before other ingredients are added in, to help it soften. Depending on the size of your beef cubes, you can remove the cubes to a cutting board, chop them into smaller pieces, and return to the pot. In another large pot, drizzle ~2 tbsp olive oil. Add onion and a pinch of salt, and cook over medium heat until slightly soft, about 5 minutes. Add garlic, celery, and bell pepper with another pinch of salt, and stir over medium-low heat for awhile. Once veggies are softened, add these cooked veggies to the first pot with beef and broth. 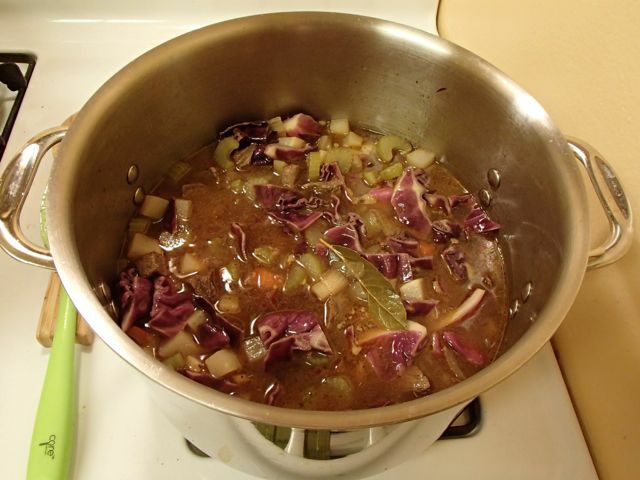 Add turnips, cabbage, bay leaves, five spice powder, cloves, and Italian/poultry seasoning to the main pot. Add water as needed to make sure veggies are just covered. Let simmer for ~1 hour, until everything is tender to your liking. Add cayenne pepper for a kick. Enjoy with a glass of red wine or your favorite fall beverage! My very favorite thing to whip up in the kitchen is a soothing pot of soup. Soup is a great culinary canvas for people with any level of skill in the kitchen, from teens just learning to cook from scratch to professional chefs that want to impress their customers. Best of all, soups and stews provide a large amount of satisfying food without crazy amounts of effort or money. Once you master the basic rules of soup, it’s easy to create your own concoctions from whatever ingredients in your fridge are calling out to be used. I value simplicity, and am guessing that my readers do, too. 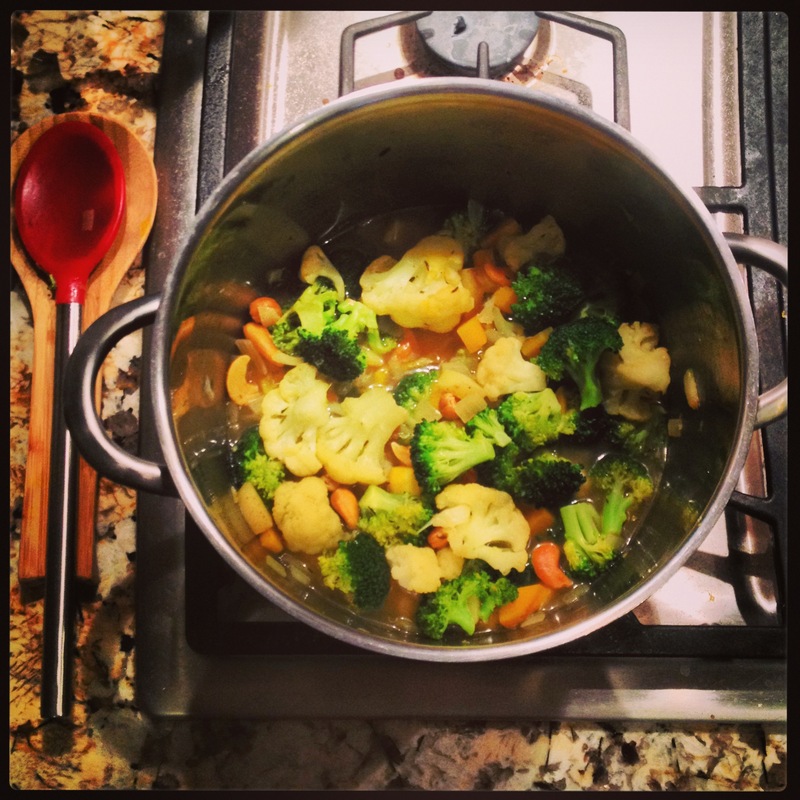 Hence, I am starting up a series of posts on my blog titled “Soup-er Simple” (pun-tacular!). I’ll post some basic tips for readers who are interested in becoming soup aficionados, and easy recipes for those who just want a quick meal idea. My goal is to create and post recipes that are very much no-fuss – not too many ingredients, no precise measurements, minimal clean-up, etc. First up – a recipe that I came up with last weekend when I was in need of a quick, filling, and healthy lunch. I had a bag of cut broccoli and cauliflower florets that I did not feel like steaming. 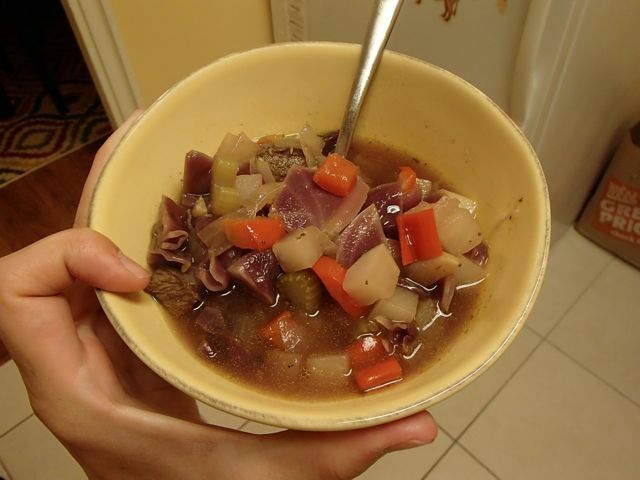 So I made them into an incredibly simple soup! An immersion blender makes this one extra easy. Vegetarian, vegan, dairy-free, gluten-free. Recipe makes about 4 servings; just double it for more! In a large stainless steel soup pot, sautee the onion and carrot with some olive oil and a solid pinch of salt until tender. Add about 1 tablespoon of curry powder and stir for about 30 seconds until it’s “toasted.” Next, toss in the chopped potato, broccoli/cauliflower florets, and cashews. Add water until the ingredients are just covered. Bring the pot to a boil, then cover and simmer for 10-15 minutes, until all ingredients are tender. 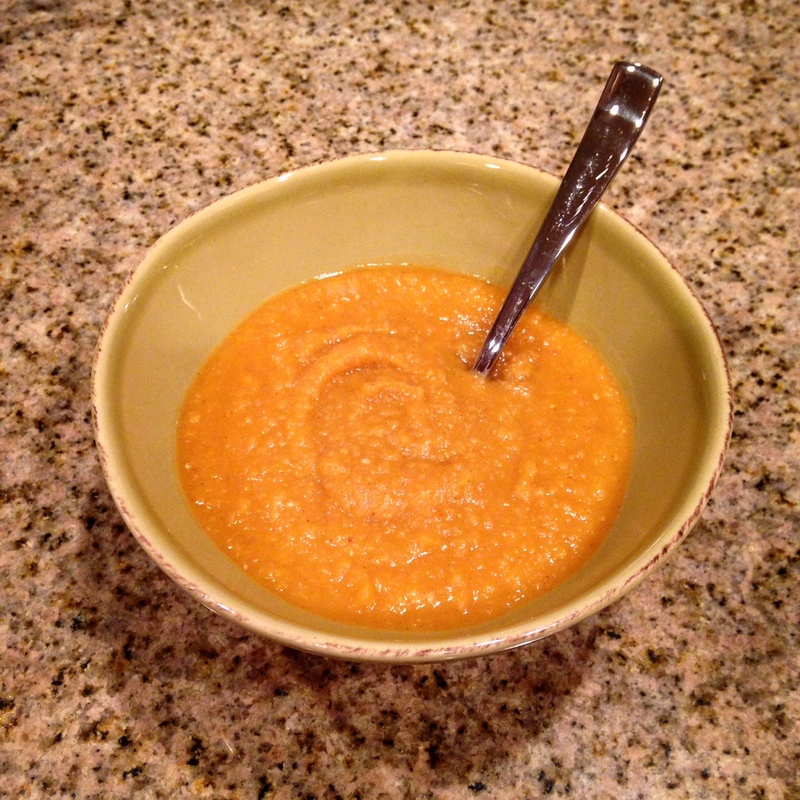 Use an immersion blender or regular blender to blend the soup to a moderately smooth consistency. Add salt, pepper, and additional curry powder to taste. This makes a great lunch or appetizer for a dinner party! This is my personal blog, unfolding from the competing interests, joys, and priorities that swarm my brain. Basically, it's a place to post various ruminations, resources, and recipes that I think might be of interest to others. Views are my own and do not reflect the position of my employer or any other entity. Choose Your Own Adventure, new mom edition!